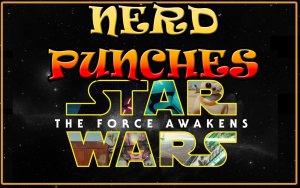 Nerd Punches 2016 in Review – Comic Book Movies! The gang returns with J, B, and super special secret guest the mysterious Mister S to discuss the comic books they saw (and the ones they didn’t see) from 2016 and speculate on everything coming up next year! Benj and Jerm go it solo to recommend the fantastic and underrated FX show “You’re the Worst”. The boys are back! 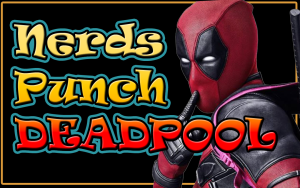 Benjy and Jeremy join super special guest Sam to discuss — and debate — the merits and demerits of the latest comic book movie DEADPOOL. Is it the best comic book movie in a year or only near that? Listen in and find out! Remembering Bowie & Rickman + The Nerdiest Movie of 2015! The gang’s all here as Benj and Jerm are joined by special guest Sam! First we reminisce about the recently departed icons of Alan Rickman and David Bowie, then we visit Sam’s Complaint Corner and finish it off with a hearty discussion of the Nerdiest Movie of 2015! Who wins? Avengers? Ant-Man? Star Wars? Pitch Perfect 2? Listen and find out! Benj and Jerm discuss the big nerdy movie and have some pleasant arguments about everything from the Star to the Wars. Will Game of Thrones Spoil the Books? The dudes discuss and argue about whether or not it’s worth watching the new season of Game of Thrones if it’ll spoil the books. Decide or do not, there is no try! 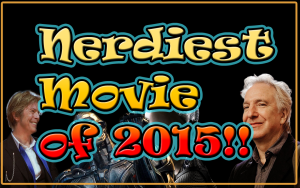 What was the Nerdiest Movie of 2014? Our feature length PODCAST where we start in January 2014 and head straight for December, carefully debating and arguing and punching until we crown… the Nerdiest Movie of 2014. Will it be Birdman? The Lego Movie? Neither? Yes that’s right, it’s the next SIX+ years of comic book movies, from Avengers II (2015) to “Untitled Batman Movie” (Year Unknown)! We give each of these announced movies the attention they deserve (but probably don’t need). But first, who would you want to see in a LEGO movie? The boys fully review and rate the latest movie from the Marvel folks. Rave and review, that’s the ticket! Over an hour of pure nerdiness!